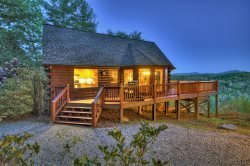 Red Rocker This cabin is a beautiful 3-bedroom 3-baths, game room with pool table, wood burning rock hearth fire place in Living Room, gas log fireplace in game, with long range mountain views, circular driveway, and paved access. Recently updated. Enjoy the views from the hot tub or from one of the comfortable rocking chairs! Buffy and Tracy were both awesome to do business with!! Above and beyond getting me and my pups in last minute on a holiday!! Thanks y'all!! The cabin was beautiful and so are the memories of an amazing time!! We really enjoyed our stay. I was more than pleased with the cabin and location. Only problem we had was the toilet started leaking and the game room exterior door dead bolt didn't work!